Acne scars are a permanent defect within the skin that forms following resolution of an acne lesion. These scars are often sunken-in, fibrous and can be pink or red depending on the patients skin colour. There are three main categories of depressed Acne Scars or Spots that we can treat effectively with lasers. Keloid – a type of raised scar that grows over and around the acne lesion often becoming quite large, thick, and rubbery. Acne scars do not occur in all people who have acne. The cause of acne scarring is the result of family genetics and sometimes more likely in those individuals with sever cases of acne. How Do I Prevent Acne Scars? This is the most important part of avoiding acne and their scars in the first place. Treating acne when it is more than small pimples that heal quickly will prevent long term consequences like scarring of the skin. Dr. Crippen will commonly use a combination of medication from the pharmacy and light sources to hinder the appearance of acne lesions. We normally see an excellent reduction in acne lesions for patients who follow our strict protocols for treating acne vulgaris. Not everyone “grows out” of their acne either and some people will get acne for the first time in their 30s or 40s. We treat patients of all ages and each treatment is individualized to their specific problem. Watch Dr. Crippen remove an Acne Scar using laser. This acne scar was the result of a large cyst that never completely resolved after many months. Some examples of our own Acne Scar Patients who have had laser treatments. Acne Scars – 4 Fractional Laser Treatments to smooth out his cheek icepick acne scars. 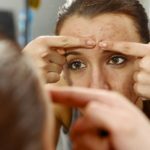 Acne scarring on face, Hi there - I am interested in knowing what the cost of treating acne scarring may be. My son has quite a bit of scarring on his cheeks and is now on prescribed medication to reduce the acne problem but he has quite a bit of scarring to deal with. Acne preventable? The girls in my family typically have horrible problems with acne, and I never want to see my daughter go through that. Is acne at all preventable with the right treatments? Can it be treated early enough that really bad breakouts never happen? Acne certainly does run in families but that is no guarantee that each person will be affected in the same way. Once acne is becoming a problem, absolutely we can make a huge difference with medications. The key is to prevent acne scarring which will cause permanent disfiguration to the skin. It is much easier to prevent acne in the first place than to try and remove scars once they are present. How do I keep acne scars from developing? I've seen this happening to my sister, and I want to avoid it. You’re absolutely right that preventing acne in the first place is the best way to avoid acne scars in the future. Even though we can help acne scarring with laser treatments, prevention should be the first goal at any stage if possible. Best to see your local physician who deals with skin a great deal to treat any acne. Every acne pimple/breakout will cause some scarring from microscopic (invisible to the eye) to very noticeable deep depressions in the skin. For nodular or cystic acne, sometimes Accutane is recommended as a treatment/cure for some patients. What is the Best Treatment for Ice Pick Acne Scars? Ice Pick Acne scars are best treated using ablative lasers that remove skin tissue and encourage significant skin healing and new skin growth. A fractional CO2 laser is the gold standard treatment for this kind of problem and multiple treatments are normally required for significant long lasting results. What is the Best Treatment for Large Pores and Minor Acne Scarring? This depends on the case, sometimes excision of a large pore will give the best cosmetic outcome and sometimes ablative CO2 laser therapy is the best choice. The patient’s medical history, skin condition and size of pore/scar will all influence the treatment options. What are the Side Effects from Acne Scar Laser Treatment? If ablative lasers are used to remove skin/tissue, there will be some redness, swelling and mild discomfort following the procedure for a handful of days on average. These kinds of lasers remove skin so the body has to grow new skin to replace what we have removed and as a result there are always certain side effects that can be expected. Much less common problems of skin pigmentation issues, infection and scarring are rarely seen if the patient follows post care instructions. What is the Fastest Acne Scar Removal for Face and Chest Areas? Again, this depends on the case but a variety of laser options exist for these conditions. Occasionally a vascular laser (VBeam) will be used to reduce the redness in the skin while fractional CO2 lasers will be used to smoothen the skin. Sometimes injection of a steroid medication into a large, bumpy scar will be required to improve the scarring associated with cystic acne. Is It Safe to Have Laser Treatment While Breast Feeding? Lasers only interact with the skin and have no distant effects on the body so yes, they are, for the most part, safe while breastfeeding unless we are using local anesthetic with them. This all depends on the procedure of course and a formal assessment is required in each situation. Can Acne Scars Be Completely Removed? We can only improve acne scars, never completely remove them. A significant improvement can be made with different lasers but normal skin is usually not achievable with the technologies available today. We can never promise patients something that is unrealistic to achieve. Differences Between Tradtional CO2 Laser and Fractional Laser? 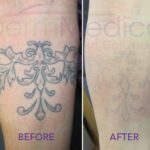 The traditional method of fully ablative CO2 laser treatments is to remove a full layer of skin evenly across a given area which results in significant downtime and risks. Fractional CO2 lasers, as the name implies, only treats a fraction of the skin by producing small holes in the skin, leaving normal skin right next to it. The result is less downtime for the patient, however more treatments are needed to see the same amount of change as a traditional CO2 laser treatment but with much less risk. Which Laser Would Work Best for Cystic and Raised Keloid Acne Scars? A combination of vascular lasers (VBeam) and the fractional CO2 laser would work best in this situation. We would also likely inject the lesion with some steroid to reduce the size of the scar before performing any fractional laser treatments. Our fractional CO2 laser treatment is called the DermaPeel. 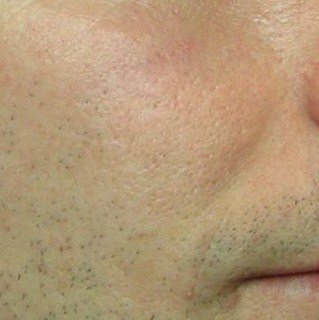 Microdermabrasion Vs Laser Genesis for Acne Scars? Microdermabrasion and laser genesis will not give much of a result for acne scars. Microdermabrasion is good to remove dead skin on the surface leaving the skin feeling temporarily smoother. Laser genesis is a brand name for a laser that does not have much of an effect on acne scars either. These treatments would leave the patient with little to no downtime as well as no results.